How one of the worlds largest mining companies, Anglo-American, transformed from a decentralized procurement governance model to a center-led model. Crucially, how they tackled the human, political, and change management issues to make it a success. Moving from a decentralized to centralized procurement model is challenging. It was therefore with great interest that I listened to Susan Lasecki-Coiro, Head of Strategy and Performance for Anglo American’s Group Supply Chain, who gave a talk at Emptoris Empower this year about just such a transformation at her firm. Anglo American is one of the largest diversified mining companies in the world, with $28B revenue in 2010 and over $18B revenue in the first half of 2011. The main commodities that they mine are platinum, iron ore, diamonds, metallurgical and thermal coal, copper, and nickel. In 2008, Anglo American had a wake-up call. 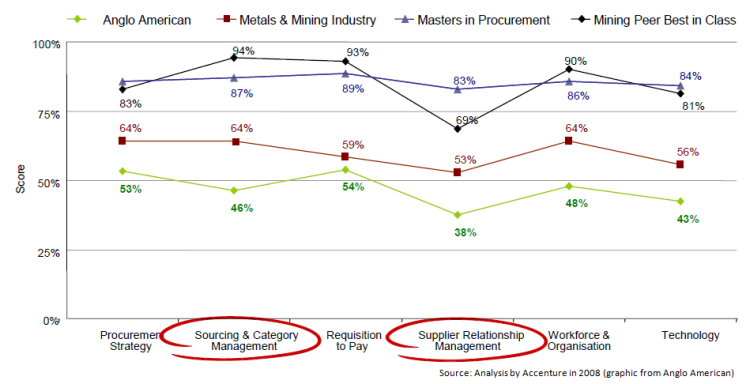 An analysis by Accenture ranked them well below industry average across various dimensions of sourcing and procurement (see Figure 1). In 2008, Anglo American launched their “One Anglo Supply Chain” project, setting a publically stated goal of creating $1 Billion in additional value by end of 2011, through improvements in organization, category management, processes, and systems. An important component of this was moving to center-led teams. Anglo American had a decentralized procurement model. Each business unit had their own autonomous procurement group. Across the business units, there were many common suppliers and areas of spend such as fuel, lubricants, explosives, mining equipment, tires, various services, and temporary labor. This created a large opportunity to consolidate spend. Towards this goal, Anglo American created four centralized category teams—Projects & Services, Mining Production, Processing and Transportation, and Support Services and Equipment (Figure 2). The category teams worked closely with each business unit’s supply team, working across functions and business units to identify and create value and provide a single face to supply markets. The business units’ supply teams are the ones who really understand the specific needs and the opportunities in each business. They are best suited to align the strategies being created by the category teams with the needs of each unit. The business unit supply teams also are responsible for taking these strategies and actually implementing them in the business. Without the buy-in and full support of those champions in each business unit, there would have been no implementation and hence no value created. Anglo American created a strategic category board overseeing all categories and businesses to make cohesive decisions across the enterprise. They also created a published set of financial policies and goals. The outcomes are measured in each business unit and the results are communicated broadly. This provides motivation and focus and shows everyone the benefits. This has proven useful in unexpected ways. For example, when the firm was considering merging with another mining company, the supply chain group was able to demonstrate clearly the amount of value that would be lost if the new supply chain model was destroyed in the process of merging. The first focus for Anglo American was leveraging their scale; identifying opportunities for savings by aggregating global spend in each category. The emphasis quickly grew to encompass more holistic category strategies including process optimization and low cost country sourcing. Anglo American implemented process improvements and new systems in contract management, strategic sourcing, spend analysis, R2P (Requisition-to-Pay), and MDM (Master Data Management). The Spend Analysis, Strategic Sourcing, and Contract Lifecycle Management systems were all from Emptoris. These were integrated with two different ERP systems (SAP and Mincom’s Ellipse) in 18 ERP instances globally across Anglo American’s seven business units. Anglo American realized that deploying systems does not guarantee they will be used or fully leveraged. They understood that development of their people was critical for success. They achieved transformation by investing in capability development for the team they had, rather than looking for a new team that already had the needed skills. The process of learning and capability development they use is demand led and is based on action learning. It is specifically not “death by PowerPoint” or putting people through training where 80% of what employees hear they never use. Nor does it involve assessing employees’ capabilities and then telling them what they need to learn. Instead it is action learning—taking a real challenge the employee has and applying learning directly to that challenge. The employees learn by experience and that learning experience then becomes the way they operate. In this way, employees are learning “On Demand,” just what they need, when they need it. Anglo American also teaches “insightful questioning” to their employees to encourage breakthrough thinking and help each other solve problems. As a result of all this, Anglo American received the top award for people development from Procurement Leaders in 2011. Lasecki-Coiro said that in too many cases change management is viewed as something you do to your employees. Instead, Anglo American starts with engagement; actually listening to people. They have feedback loops where they listen and actually address the issues people are having and help them. Throughout the organization, they have built capabilities development skills. The Supply Chain organization sits in between many different groups. Facilitation skills are taught to supply chain personnel to enable them to tap into and coordinate the intelligence of many different groups throughout the enterprise. What’s Next? Local Procurement, SRM, and More. Anglo American is moving to support more local procurement, which creates jobs and goodwill by growing the economies in the areas they live and work in. It also drives integration between the supply chain, business units, and functions. They are developing country-specific strategies for local procurement, for example creating supplier parks in South Africa, so that suppliers don’t have to worry about infrastructure. They are integrating their local procurement with Chinese sourcing by bringing part of the Chinese value chain closer to where they operate. Anglo American launched Supplier Relationship Management (SRM) in November 2010. They are integrating supplier collaboration into their business units’ strategies. Before this, they had many different uncoordinated supplier relationships across the business units. Now the central supply chain group facilitates a common process to enable constructive relationships at all levels, aligned with common contracts across the organization. Having a common set of processes and contracts creates value. Anglo American’s supply chain organization is on target to deliver $1 billion in value this year. Lasecki-Coiro said that beyond 2011 they have many exciting new initiatives planned and will create yet more value beyond what they have already delivered.